The Studio plate coordinates well with any architectural style. Its shorter length is ideal for bedroom or bath but can be used in any room. Combine this with the Craftsman knob for a distinctly hand-crafted look. All Craftsman knobs are forged brass for durability and beauty. Use our HARDWARE DESIGNER to mix-and-match any plate or rosette with any knob. 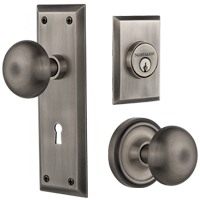 Passage/Privacy sold as complete set with latch and strike plate. Works with many original (pre-1950s) locks. Split finish available at no extra charge. All sets fit doors 1-3/8″ to 1-3/4″ thick. 2-3/8″ backset standard unless 2-3/4″ specified. For pricing information contact a Nostalgic Dealer. Nostalgic Warehouse warrants its products to be free from defects in materials and workmanship. This warranty is extended to the original user of Nostalgic Warehouse products as long as the User occupies the residential premises on which the Products were originally installed. Not covered under this warranty are: 1) product finishes, 2) Products which have been incorrectly installed or mistreated, 3) non-residential applications of Products, 4) crystal and porcelain Products against breakage. Once a Product has been returned to Nostalgic Warehouse, the Product will either be repaired or replaced. Liability shall be limited to the maximum dollar amount of the original purchase price. Proof of purchase will be required. Under no circumstances shall Nostalgic Warehouse be held liable for any incidental or consequential damages arising from the use, installation, modification or sale of this Product. Note: Some states do not allow limitations on incidental or consequential damages, so the above limitation may not fully apply. This warranty gives you specific legal rights and you may also have other rights that vary from state to state. Nostalgic Warehouse warrants its products against tarnishing. This warranty is extended to the original purchaser of Nostalgic Warehouse products as long as the User occupies the residential premises on which the Products were originally installed. Not covered under this warranty are: 1) Products which have been scratched or abraded, 2) Products which have been incorrectly installed or mistreated, 3) non-residential applications of Products 4) Products intended for interior locations which have been used in exterior applications and 5) finishes which are specifically designed to wear over time (i.e. Living finishes). Once a Product has been returned to Nostalgic Warehouse, the Product will either be repaired or replaced. Liability shall be limited to the maximum dollar amount of the original purchase price. Proof of purchase will be required. Under no circumstances shall Nostalgic Warehouse be held liable for any incidental or consequential damages arising from the use, installation, modification or sale of this Product. Note: Oil-rubbed Bronze finish is classified as a Living Finish and is intended to change appearance with use. Note: Use of chemical cleansers on Nostalgic Warehouse products will void the finish warranty. Note: Nostalgic Warehouse will warrant passage sets used in exterior locations provided the lockset is used with a Nostalgic Warehouse deadbolt. This warranty gives you specific legal rights and you may also have other rights that vary from state to state. THE COMPANY MAKES NO OTHER WARRANTY, AND ALL IMPLIED WARRANTIES INCLUDING ANY WARRANTY OF MERCHANTABILITY OR FITNESS FOR A PARTICULAR PURPOSE ARE LIMITED TO THE DURATION OF THE EXPRESSED WARRANTY PERIOD AS SET FORTH ABOVE. THE COMPANY’S MAXIMUM LIABILITY HEREUNDER IS LIMITED TO THE PURCHASE PRICE OF THE PRODUCT. IN NO EVENT SHALL THE COMPANY BE LIABLE FOR ANY CONSEQUENTIAL, INDIRECT, INCIDENTAL OR SPECIAL DAMAGES OF ANY NATURE ARISING FROM THE SALE OR USE OF THIS PRODUCT, WHETHER IN CONTRACT, TORT, STRICT LIABILITY OR OTHERWISE.